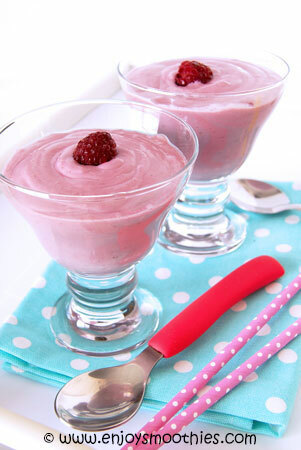 We all know strawberries and bananas go together, but have you tried raspberries with bananas? I think a raspberry banana smoothie is just as good as the strawberry variety. 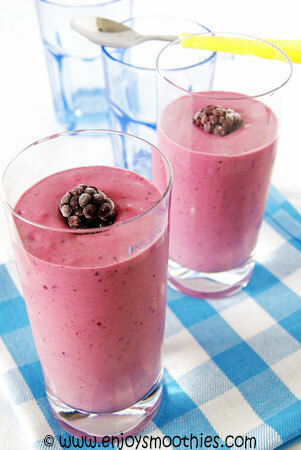 Raspberries are sweet, they are juicy and they are red and they blend up the most deliciously pink smoothies. Raspberries can be paired with other sweet fruits, such as berries, peaches, pineapple and citrus. Try thickening with yogurt, nut butters or using frozen banana. If your smoothie needs a little bit of sweetening, try maple syrup or honey. One or two teaspoons should be sufficient. And let’s not forget the health benefits. Raspberries are rich in vitamin C and high in antioxidants. And bananas are packed with some of the most essential nutrients our bodies need for good health. A truly healthy combination. This is your basic banana raspberry smoothie. But we have added some maca to turn it in to a super healthy treat. 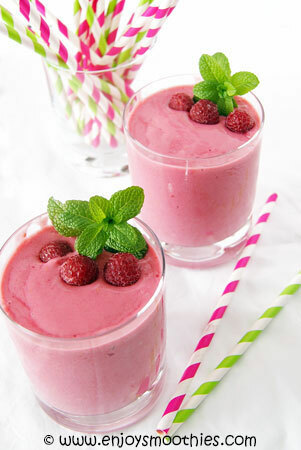 Place the frozen raspberries, banana, yogurt, almond milk and maca into a blender. Start the blender on low until the raspberries are broken up, then turn up to high and whizz until your smoothie is rich and creamy. If you have a high speed blender just add the cashews, banana, raspberries, coconut milk and maple syrup to your blender. Blitz until the nuts are crushed and the other ingredients are smooth and creamy. (If you don’t have a high speed blender you will need to crush the nuts in a processor first). The almond butter makes this smoothie wonderfully thick and creamy. You can almost eat it with a spoon. Place raspberries, mixed berries, banana, almond milk, almond butter and honey into the jug of a blender and blitz until all the ingredients are pureed.